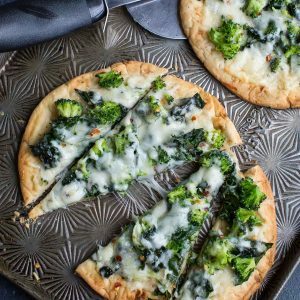 This cheesy broccoli kale pesto pizza uses store bought flatbread for a fast and flavorful personal pizza, perfect for busy weekdays! Do you ever end up with little bits of leftover veggies? The glory of these little veggie scraps is that you don’t have to waste them! Save ’em up over the course of the week and make the most epic personal pizza you ever did see! The combinations are as endless as they are delicious! So grab some fluffy naan or pita bread, (or even some french bread or bagels!) because we’re making some super speedy personal pizzas today! Skip the sandwich and serve them up for lunch alongside a cup of your favorite soup or a leafy green salad. Or dinner! Or even breakfast if you’re feeling rebellious! I’m seriously loving this white-pizza-gone-green with it’s garlicky pesto base, ultra-melty medley of cheeses, and fresh veggies. The below recipe is for three feisty flatbread pizzas but feel free to eyeball the measurements (because hello, pizza!) based on how many you’d like to make and also customize your pie to your heart’s content. Anything goes in love and pizza! Arrange flatbread on a foil lined baking sheet. Combine olive oil and minced garlic, spread evenly on each. While your flatbread bakes, fill a pot or skillet with 1 cup of water and bring to a boil. 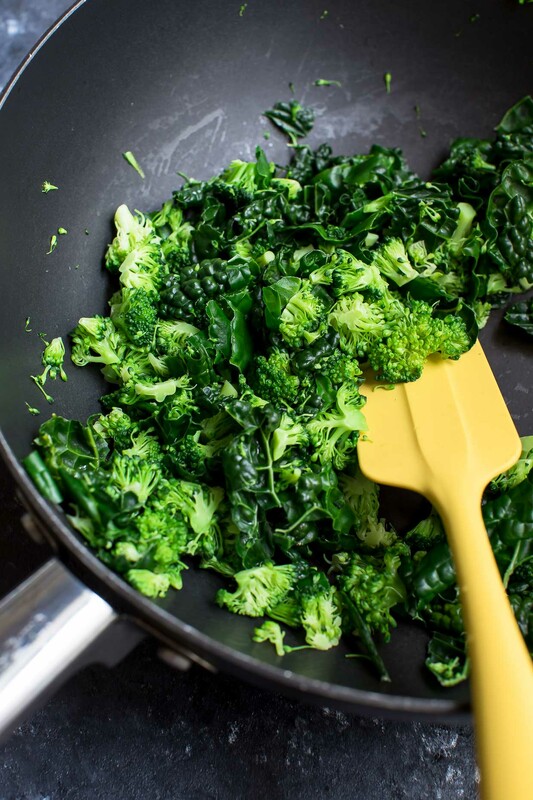 Quickly blanch your kale and broccoli for 1 minute. Drain and remove from heat. (You can also sauté them in a little butter or oil if preferred over blanching!) Season with salt and pepper as desired. Once flatbread are ready, spread generously with pesto and top with a little bit of the cheese. Add your veggies and remaining cheese on top. Bake for an additional 10-12 minutes, or until perfectly hot and melty. Top with crushed red pepper flakes (optional + spicy!) or an additional sprinkle of parmesan cheese if desired. Crumbled feta also makes a tasty topper! Dive in and enjoy! No kale? No problem! Try it with fresh spinach for an equally tasty pizza! Recipe yields 3 tasty personal pizzas. 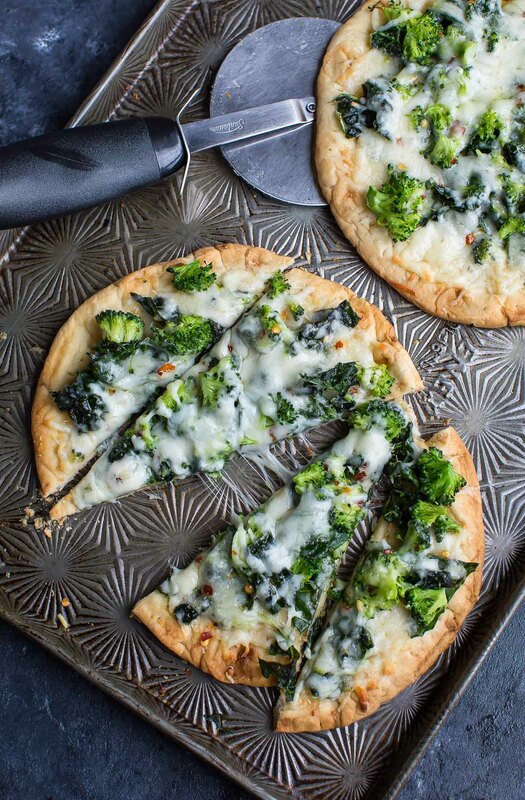 What a great way to get your veggies in this pizza. Perfect for lunch especially with my homemade pesto I just made. 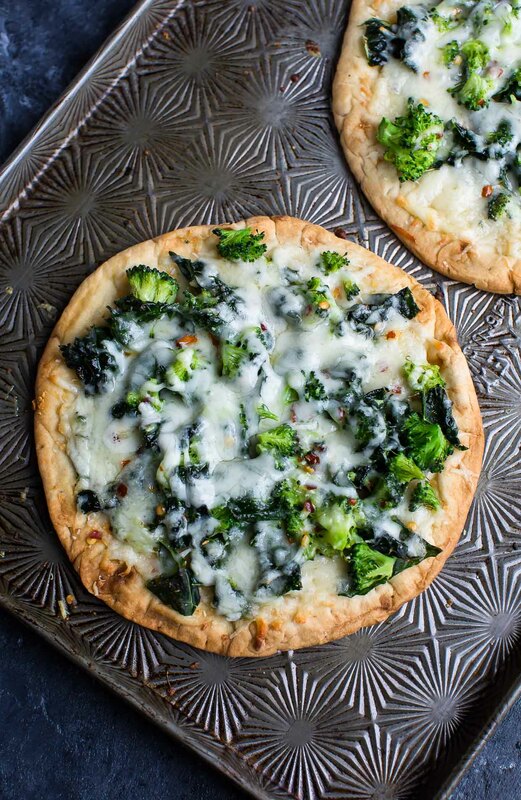 These little flatbread pizzas look so good, Jen! 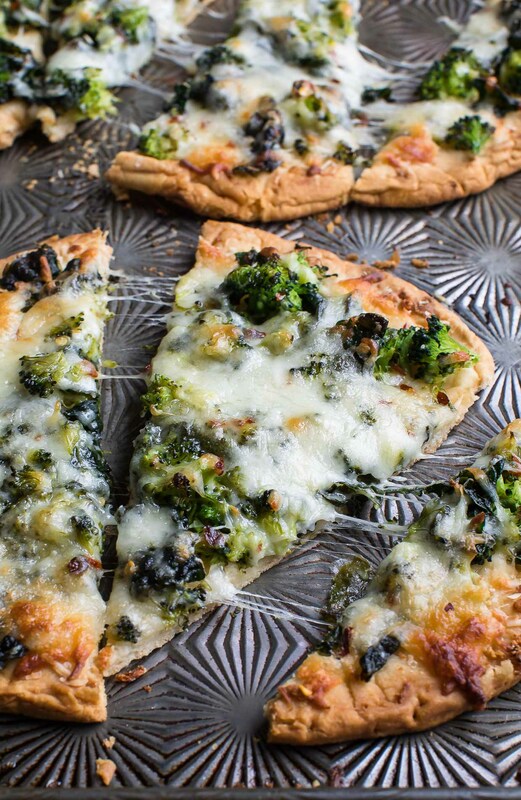 I love this idea for an easy pizza night. THIS pizza would be one way I get my daughter to actually ENJOY kale and not have to mask it in a smoothie! Delicious! I’m obsessed with Pesto. I love that you added so many vegetables in this pizza. It makes it extra healthy. The more veggies the better! Woot woot! Thanks Iryna! I laughed at the olive comment. I’m not fond of them either so, just know, you are not alone!! Though, I do love one brand of olive for my martini :). This pizza looks so delicious. I love broccoli and kale together!! I am loving homemade pizza lately and have been eating tons of kale! This looks like the perfect way to eat it! Another option? I love using bell peppers and Zucchini as pizza bases too – healthy and so super easy!